Andrew, Brady, Britini and Joey with Captain Mark, Mate Tony and Blue Marlin! Mahalo to Andrew, Bradey, Britini and Joey for choosing Maggie Joe Sport Fishing! Congratulations on your great catch! The group departed Kewalo Basin, next to Waikiki, in the early morning on a sport fishing charter aboard the Maggie Joe with Captain Mark and Mate Tony. 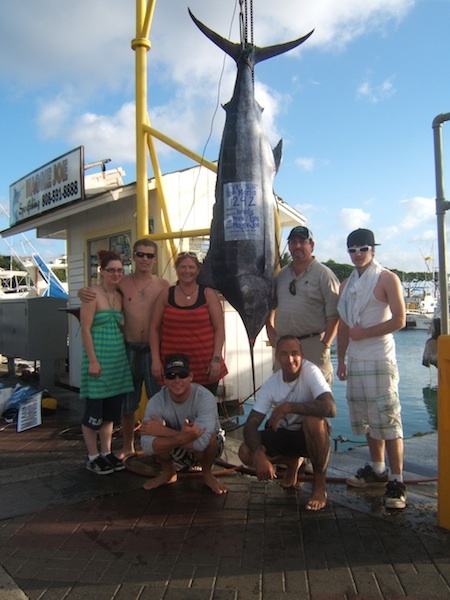 They hauled in this giant 297 lb Blue Marlin while deep sea fishing outside of Honolulu, Oahu! Great job! Scott and Gary with 2 Mahi Mahi! Mahalo to Scott and Gary for choosing Maggie Joe Sport Fishing! Despite the heavy rain, Scott and Gary joined us aboard the Sea Hawk on a sport fishing charter and we had a great time! 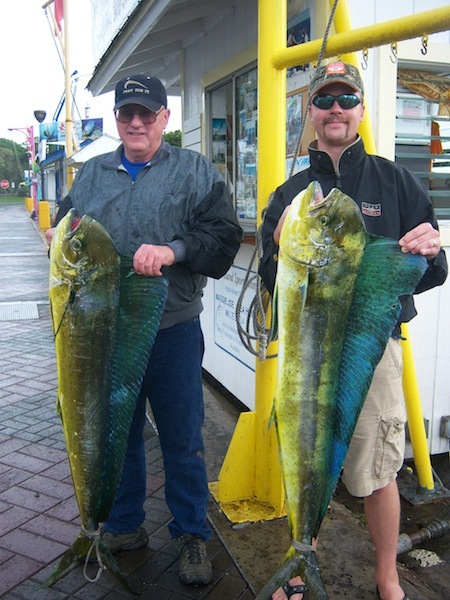 The guys hauled in these two Mahi Mahi while deep sea fishing outside of Honolulu, Oahu! Good time and good eating! Aloha! 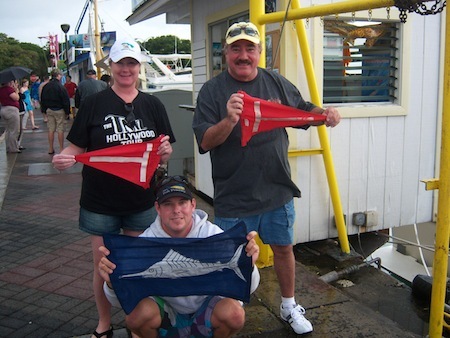 Gerri and Cheryl with Captain Mark and 2 Blue Marlin Tag and Release Flags! Mahalo to Gerri and Cheryl for choosing Maggie Joe Sport Fishing! The couple joined Captain Mark aboard the Maggie Joe on a sport fishing charter. The day was productive as they were able to haul in and tag and release 2 blue marlin while deep sea fishing outside of Honolulu, Oahu. As an angler you always have the option to tag and release your catch with Maggie Joe Sport Fishing… either way… if caught the fish are a sustainable way of providing fish to the local population (or yourself!) or tagging and releasing allows for much needed scientific research to be done on these great fish! Aloha and congractulations! Doyle with his Blue Marlin! Doyle, mahalo for choosing Maggie Joe Sport Fishing! Mike, Robert, Mike and Kyle with 205 lb and 120 lb Blue Marlin and Stripey with Captain Mike and Mark! Mahalo to Mike, Robert, Mike and Kyle for choosing Maggie Joe Sport Fishing! The guys departed Kewalo Basin, next to Waikiki, aboard the Maggie Joe with Captain Mike and Mark on a sport fishing charter. They had a great day of deep sea fishing outside of Honolulu, Oahu as they hauled in 2 Blue Marlin and a Stripey! Aloha and congratulations! Nobu, Daigo, Tetsuya, Masateru, Fumito, Shungo and Tsuyoshi with Striped Marlin and Spearfish! 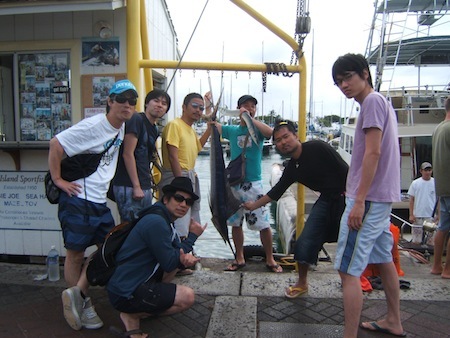 Mahalo to Nobu, Daigo, Masateru, Fumito, Shungo and Tsuyoshi for choosing Maggie Joe Sport Fishing! The guys joined Captain Mike, Morgan and Decky Johnny aboard the Maggie Joe for a full day sport fishing charter. While deep sea fishing outside of Honolulu, Oahu they had four strikes and were able to haul in this spearfish and striped marlin! Aloha and congratulations! 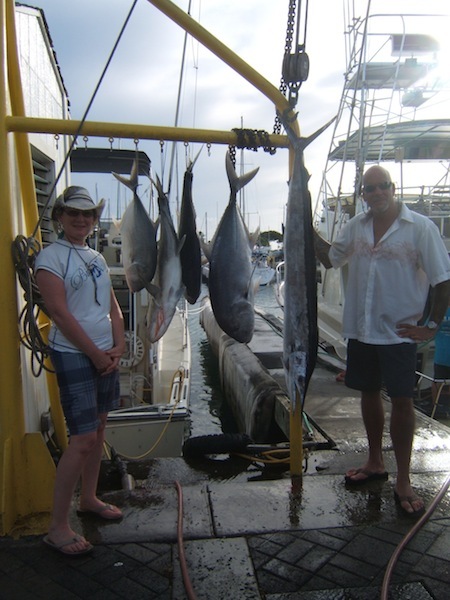 Mary and Wayne with Spearfish and 4 Ulua! Mahalo to Mary and Wayne for choosing Maggie Joe Sport Fishing! They departed Kewalo Basin, next to Waikiki, in the early morning on a full day sport fishing charter aboard the Maggie Joe with Captain Mike, Mark and Decky Johnny. They hauled in this Spearfish while deep sea fishing outside of Honolulu, Oahu. On the way back home the wind picked up and Captain Mike headed in close to shore… on the way in four poles went off at the same time! On the other end was a group of Ulua… the largest being 50 lbs! Aloha and congratulations! Angler Paul, Wife Karen, Captain Mike and Mark with 140 lb Blue Marlin! 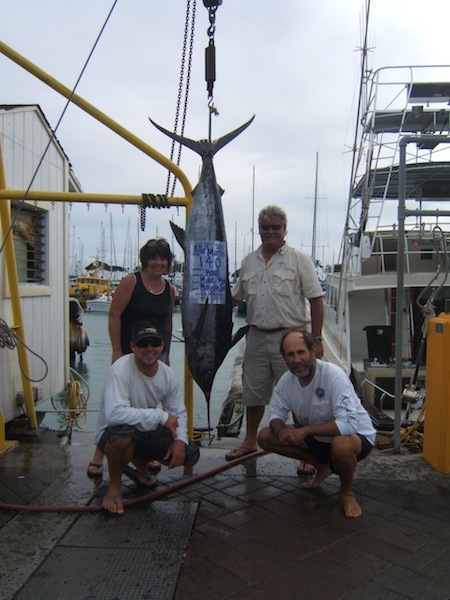 Mahalo to Paul and Karen for choosing Maggie Joe Sport Fishing! They had a great day out on the water on a sport fishing charter aboard the Maggie Joe with Captain Mike and Mark. 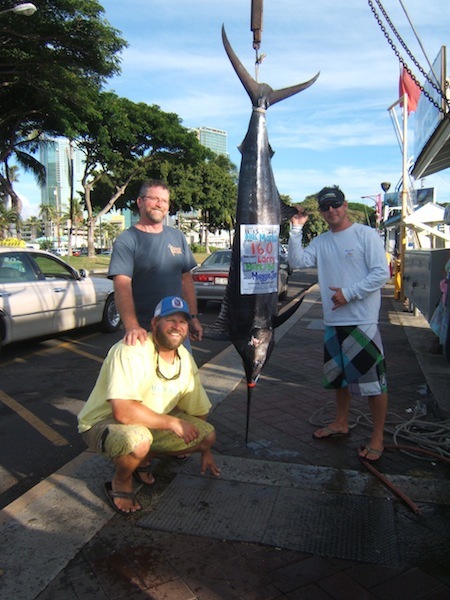 Paul did a great job angling and hauled in this nice 140 lb Blue Marlin while deep sea fishing outside of Honolulu, Oahu! Aloha! 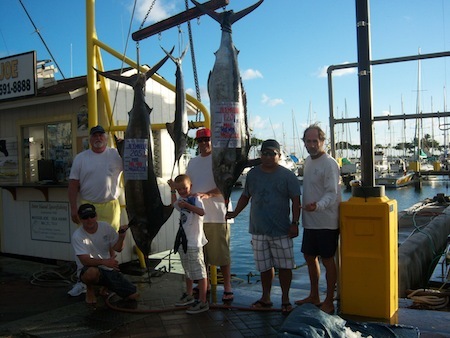 Mahalo to Tom, Juan, Zack, Matt and Kristin for choosing Maggie Joe Sport Fishing! The group hauled in a Mahi Mahi, a Shibi and a pair of Aku while deep sea fishing outside of Honolulu, Oahu aboard the Ruckus! Aloha and enjoy the good eating! Angler Larry with Captain Mark, Mate Billy and 160 lb Blue Marlin! 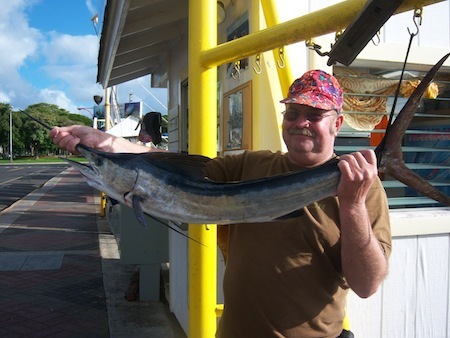 Mahalo to Angler Larry for choosing Maggie Joe Sport Fishing. Larry joined Captain Mark and Mate Billy aboard the Maggie Joe on a sport fishing charter. While deep sea fishing outside of Waikiki, Oahu Captain Mark was able to find the fish. When the line went out, Larry hopped in the fighting chair and hauled in this 160 lb Blue Marlin! Aloha!